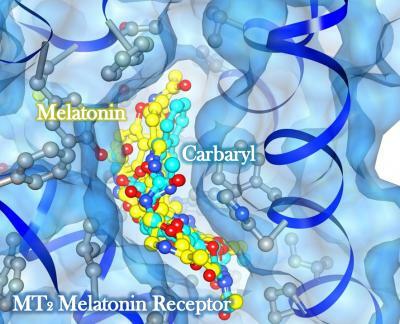 This image demonstrates how melatonin (in yellow) and carbaryl, (in light turquoise), a commonly used insecticide, bind directly to the same binding region on the human melatonin receptor. UB scientists have evidence that exposure to one of the most commonly used insecticides creates a higher risk for metabolic diseases like diabetes. The research suggests that exposure to these insecticides adversely affects melatonin receptor signaling, creating a higher risk for metabolic diseases such as diabetes. Published on Dec. 27 in Chemical Research in Toxicology, the research combined a big data approach, using computer modeling on millions of chemicals, with standard wet-laboratory experiments. It was funded by a grant from the National Institute of Environmental Health Sciences, part of the National Institutes of Health. “Our approach seamlessly integrates the screening of environmental chemicals through computer simulation, in vitro and in vivo techniques to gauge the risk these chemicals present for various disease end points,” explained Raj Rajnarayanan, PhD, lead author and assistant professor of pharmacology and toxicology at UB.